Since version 2.5 of Registrations for the Events Calendar Pro, you have several more options for adding costs to your events in addition to the event cost. 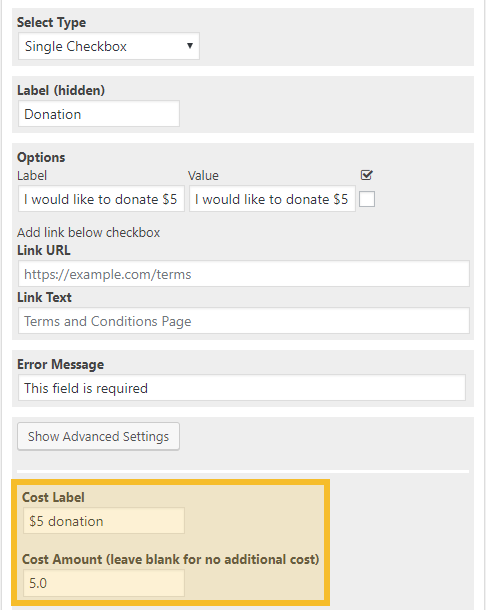 You can add costs to several of your form field types by editing fields using the form field editor. You can also add a tax or surcharge to the entire purchase using the field on the “Payments” tab. Keep reading for more details on these. You can allow attendees to opt-in to a single additional cost using the “Single Checkbox” form field type. 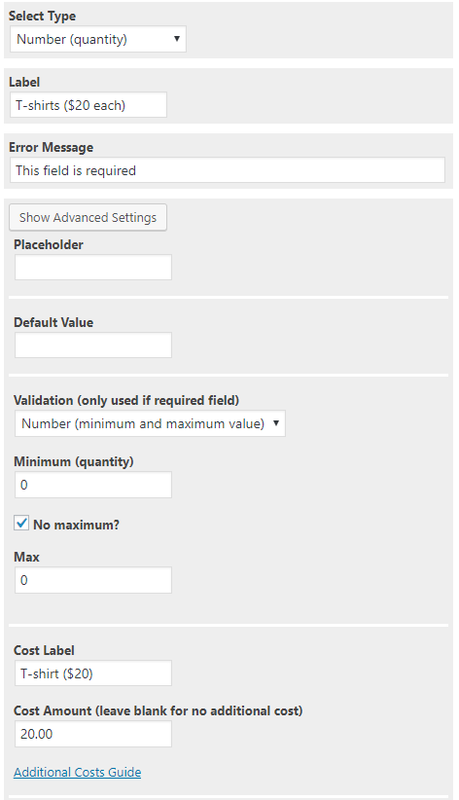 While creating a single checkbox form field, reveal the advanced settings using the “Show Advanced Settings” button. 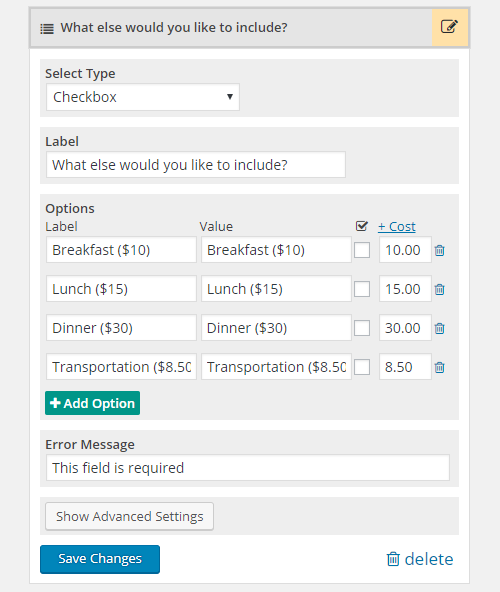 Then add the additional cost to the “Cost Amount” field as well as a label for the cost that will show up in the checkout display for the item. Using a form field of type “Number” you can charge an amount for an attendee-selected quantity. Create a “Number” field and then reveal the advanced settings using the “Show Advanced Settings” button. Then add the additional cost to the “Cost Amount” field as well as a label for the cost that will show up in the checkout display for the item. The amount entered in the “Cost Amount” field will be multiplied by the quantity entered in this field. Using a “Select,” “Radio,” or “Checkbox” field you can charge a variable amount based on a defined set of choices. While creating one of these fields, add the amount you would like to charge for each choice under the “+ Cost” column. The attendees’ selection will add the additional specified cost to the total cost of the event. Use a “Checkbox” field to allow the attendee to select multiple items and be charged for each. On the “Payments” tab, you’ll find settings to add a cost based on the specified percent of the total cost for an event. You can also choose how you would like this cost to be labeled in the checkout display.